'There Are Places I Remember': The Cavern in Colour! The two animated GIF images above are the work of Lexi, a 20 year old artist living in Brooklyn. Taking a few seconds from the black and white footage filmed by Granada TV on 22 August 1962 Lexi has managed to colourise them using Photoshop. We've probably all seen colourised black and white film and photographs before but I believe that the examples above are among the most convincing I've ever seen - so much so, you'd think they were originally filmed in colour if you didn't know otherwise. Lexi has her own blog and explains that GIF's like these usually have about 20 frames. If she is lucky she can get one done in about 20 hours. That's extraordinarily time-consuming so you can only imagine how long it would take to colourise the entire Granada clip. In the right hands it's amazing what technology is capable of. In the absence of any actual colour footage of the Beatles in the Cavern I'm sure you'll agree this is the next best thing. I can't stop looking at the sweat on their faces. 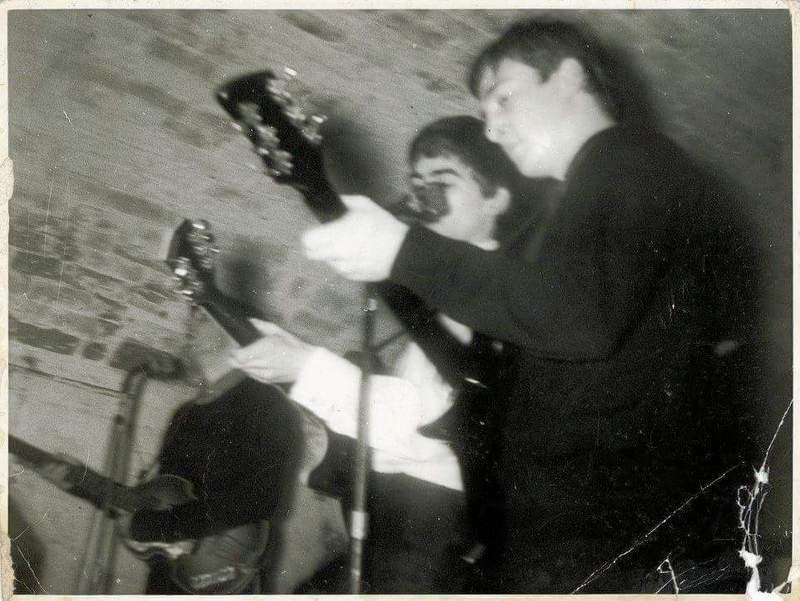 As if that wasn't enough Cavern related new-ness, the photograph below has just shown up on another Beatles' fan site, and to my knowledge has not been seen before. It looks like it was taken by a member of the audience (sitting on the front row), mid- to late-1962, judging by the haircuts. Also of note, this is one of the earliest photos of the Beatles standing on stage in the order most of the world would later see - Paul left, George middle and John right. Whether this is something they were settling on around this time or just a complete co-incidence, I guess we'll never know.